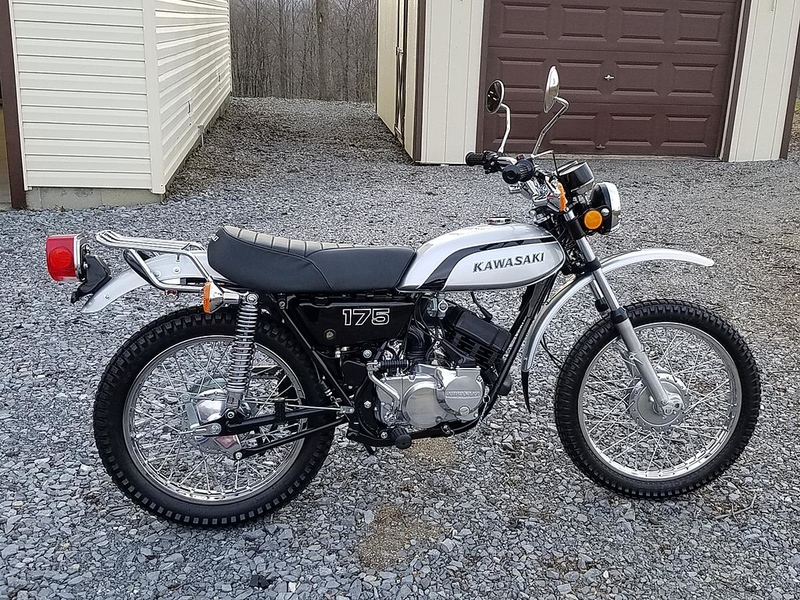 1974 Kawasaki F7 175 street and trail resto. A friend of mine back in PA restored this bike over winter and he just shared this video with me. He did such an awesome job on the bike I wanted to share it here. Skip to the end if you just want to hear it run . I had a green 1975 F7 back around 1986, I rode that thing everywhere. Re: 1974 Kawasaki F7 175 street and trail resto. Wow. That is a lot of work and it looks perfect. Those leading/no leading front forks are wild. Wow...that's a labor of love.... JOB WELL DONE! IMHO bikes from that era (my era BTW) are so much prettier than they are today. And that is a prime example! Thanks for the share! You are welcome. He has had some offers to buy it but he says he is not ready to let it go it has become one of his favorites. And he has a KTM 690, DRZ400, and KXF450.